Flexential Review 2019: Is Flexential a Good Hosting? Flexential, with its 41 different data centers spread across North America, is one of the most reliable and trustworthy dedicated server solutions providers in North America. At the start of 2018, ViaWest and Peak 10 rebranded themselves to form Flexential to boost their already dominating position in the IT industry. Flexential today aims to continue providing the same services that these two companies have been providing since 1999 and 2000 respectively. Today, Flexential has over 41 datacenters spread across North America serving over thirty-one different industries and twenty-one domestic and international markets. As of today, they serve over 4200 satisfied customers. To ensure that you have the best hardware at your disposal, Flexential offers Cisco Powered Private Cloud Environment. From top to bottom, you get a dedicated solution that is not shared with any other customer. This gives customers the peace of mind that their data isn’t at risk due to security breaches through some other customer. The highly redundant infrastructure in a secure environment means your customers need not worry about the security and privacy of their data. 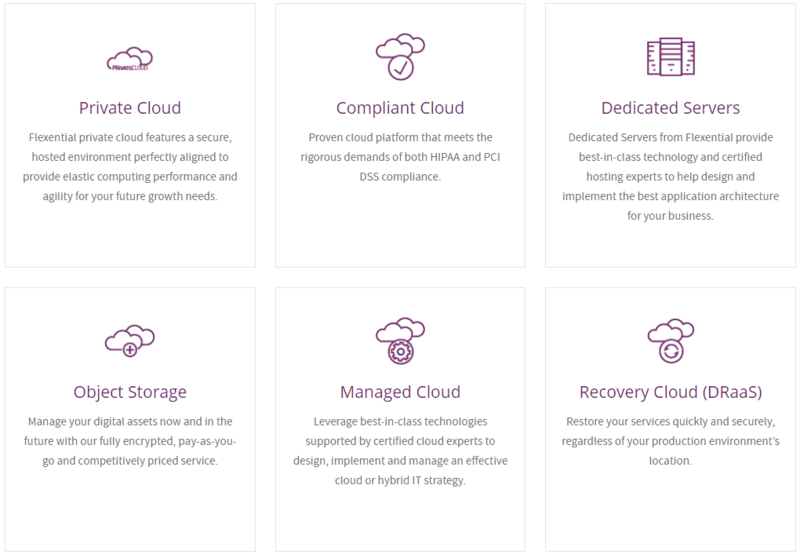 One of the biggest advantages of using Flexential is that you save time and resources that you would have to otherwise employ on hardware maintenance and management. In-House management requires a lot of resources and skilled staff but using Flexential eliminates the need for that. The time and money saved this way can be used elsewhere in the business. An IT staff that isn’t overloaded with worrying about downtimes and server maintenance can perform other tasks more efficiently. You can install a range of operating systems on your dedicated servers. These include Red Hat, CentOS, Ubuntu, and Microsoft Server. Similarly, support for MS SQL, PostgreSQL, Mongo DB, and MySQL is also available. They do not offer any pre-prepared plans since dedicated server requirements vary from one customer to another. You will need to get in touch with them and request a quote for the exact services you need. While it is not possible to compare their prices to the competition with the information available, it can be said that they have a big list of trusted partners as well as satisfied customers on their website which points to a high quality of service. As far as scalability is concerned, Flexential helps you design your dedicated server needs and ensures you are set up in a way that makes it easier to scale up in the future. It is slightly hard to get in touch with them through their website as the Contact Us page is hidden in the About Us page of their website. You can call their support or sales staff by telephone or get in touch with them via email or the contact form on the website. There is no live chat available. Flexential has a highly skilled and certified customer support staff so you can rest assured that your servers are in safe hands. It is hard to see any drawback to Flexential’s services. They have the highest quality infrastructure, certified and trained staff, and a history of providing top services in the IT industry. The list of satisfied customers on their website says a lot about their dedication to customer satisfaction over a period of two decades. Check out Flexential’s web hosting options today! Wondering how Flexential stacks up against other Web Hosting companies? Enter any other Web Hosting company and we will give you a side-by-side comparison.